The 2013 reboot of the Tomb Raider franchise was stellar; I said as much in my review last year. In an effort to squeeze a little more life out of one of the best games of last year, Square Enix has wrapped it up in a brand new package, with updated graphics and additional content and control options. It’s a game absolutely worth playing, so the question becomes: is this edition worth splurging $60 on when a much cheaper PC version exists? Three different teams worked on the overhaul made to Tomb Raider’s graphics, and it’s the most obvious addition you’ll see when you first start it up. Tomb Raider already looked fantastic even on a decent computer, but everything just feels sharper in the Definitive Edition. It’s debatable whether the changes made to Lara’s overall appearance and facial features were entirely necessary, but there’s no question that the upgrade to the foliage, stonework, and general ambience is greatly enhanced from the console versions. The PlayStation 4 version consistently hits 60 frames per second, with little to no frame skipping or screen tearing. Environments feel more alive, with tons of little details added to give each space its own unique identity. 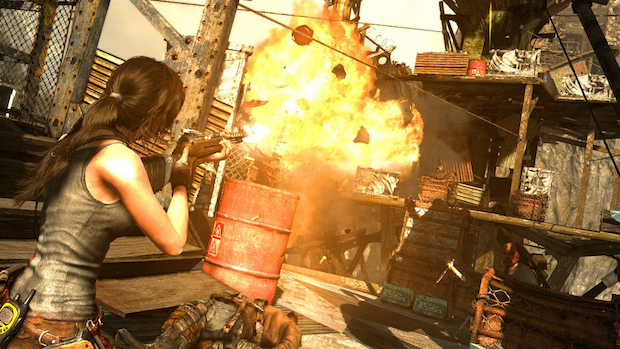 The PC version of Tomb Raider looked great to begin with, but the Definitive Edition takes it to a whole new level. In addition to the graphical improvements, Square Enix has included all of the DLC currently released, as well as a digital art book and comic. Most of the DLC additions are multiplayer centric, with a single additional tomb to raid in the main campaign — a side quest that will take you ten minutes to defeat, tops. While a nice gesture, none of these additions alone are worth the price of double-dipping. There are even features that take advantage of the control options these new consoles bring. You can shout voice commands at Lara to activate your map and switch weapons, or use the PS4’s touch pad to light your torch. The PS4’s internal speaker will relay the various radio transmissions and journals you find, and the LED on the back of the controller even pulsates as you fire your weapons. None of these features are necessary, and you’ll likely turn off voice controls the first chance you get, but none of them detract from the overall experience. Consider them superfluous curiosities. No, the real reason to grab this game again is to experience its fantastic, harrowing story once again — or, for the first time. While its narrative can feel like a low-brow television serial at times, it features some of the most compulsively entertaining gameplay from last-gen, and it still feels just as fun as ever. There’s a reason why we nominated it for our best game of 2013, and the Definitive Edition showcases that reason perfectly. Ultimately, those who’ve never set foot on Yamatai Island will find the most value in this truly definitive edition of Tomb Raider, but its bloated price makes it hard to recommend to those interested in taking the plunge again. Other than the superbly improved graphics, there’s just not enough here to warrant such a high price tag, especially when the PC version routinely sells for less than $10. That said, Tomb Raider is still an epic adventure absolutely worth your time, and the Definitive Edition is hands down the best version of this game that you’ll find — thus, it receives the same score, despite its price. While other versions of Tomb Raider may be less expensive and offer a similar experience, the Definitive Edition combines the already stellar gameplay with vastly improved graphics, creating what is most certainly the best version of Tomb Raider available.